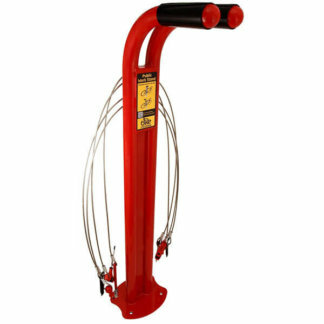 CycleSafe Vintage Racks® combine the unmatched reliability of the U rack with the charm of years past. Vintage bike racks are an outstanding short-term parking solution that looks as good as it functions. 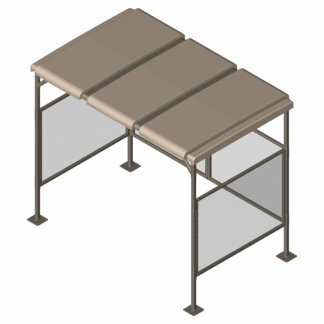 Facility managers and cyclists appreciate the design features that provide a solid bike rack that holds the bike steady from knocking handlebars or toppling into pedestrian aisles. CycleSafe Vintage bike racks are the perfect complement to urban planners’ historic streetscapes, providing short-term bicycle parking for urban or suburban locations. Vintage Bike Racks by CycleSafe offer leading technology with heavy gauge 1-1-2″ Schd. 40 steel pipe with Polyester zinc primer TGIC powder coat finishes electro-statically applied with a hard gloss finish, custom colors available upon request. Minimum order 6 units depending on stock. Lead times may vary.